Q. Where is the MyDR link? To access the Taskstream for your MyDR submissions, you will first need to open MyDR. Click on the Launch Web Landing Pages link on the Course Home of your capstone's classroom. 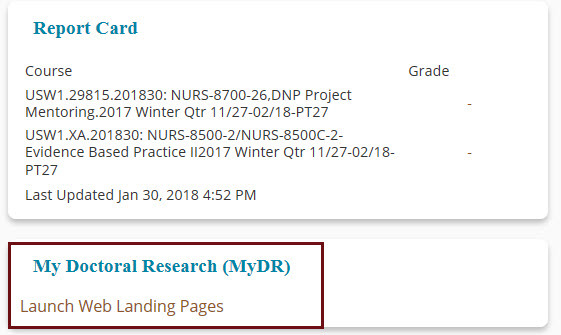 MyDR will automatically open to the page for your specific stage in your doctoral capstone (Prospectus, Proposal, or Final Study). Beneath this information is a section for Resources & Forms. Then click the DRF link for MyDR to access to where you can submit documents and review feedback. Remember: You must have both your chairperson and your second member confirmed in order to access MyDR. If you do not have both members confirmed and you are not registered for your capstone course, you will not have access to MyDR. You do not have a complete committee (approved chair and second member). Please work with OSRA for the next steps needed to complete your committee configuration. You have an inactive status with the university. Please work with your academic advisor to resolve this. You can reach your advisor by e-mailing studentsuccess@mail.waldenu.edu. You were not migrated into the MyDR system. Students who were at or beyond the Form and Style review prior to MyDR launching for your program will not use MyDR. If all of the above issues have been resolved, then it is a technical issue with the link.